Enjoy a refreshing dip any time of year at the atrium-style indoor pool. Sip on freshly-brewed coffee as you whip up your world-famous blueberry pancakes. If the sun's shining, throw lunch on the grill and challenge the crew to a friendly ping pong tournament. Hit the slopes! 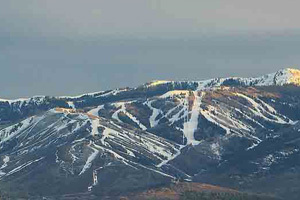 Park City Mountain Resort is just 4 minutes away by car (or shuttle). Get ready for some R 'n R thanks to the indoor hot tub. Grab some granola bars and your hiking boots - it's only a 7 minute drive to the Round Valley Trailhead. Take a few strokes off your game at the Park City Golf Course, just a short 4 minute drive away. Get ready to enjoy the best of both town and mountain at the centrally-located Park Regency Resort. Once you’ve parked in the underground garage (no more digging out your car after a snowfall!) you can shift into mountain mode. Enjoy complimentary coffee in the lobby at check-in before heading to your homey condo suite. Raring to hit the slopes? White Dog rental shop is just across the street, but for a VIP experience call up Ski Butlers. They’ll deliver gear and fit you right in your suite, and pick up the gear at the end of your trip. Who knew getting rental skis was as easy as ordering a pizza? Once your crew is warmly dressed and fully equipped, head for the mountain. The lifts at Park City Base are only a 15-minute stroll away, but why bother when the resort shuttle will whisk you right up to the slopes in minutes. At Park City Mountain Resort you can explore two base villages, 324 runs and forty lifts across a six-mile-wide mountain. Not to mention all the non-ski fun to be had like sleigh rides, snowshoeing and snowmobile tours. After a fun-filled day in the snow, mosey back to Park Regency with the crew. If nothing but a hearty home-cooked meal will do, call up the complimentary on-demand shuttle to take you to the nearby grocery store for supplies. Once everyone’s had their fill of your world-famous enchiladas, see who’s up for a soak at the hot tub (everyone). Plan for tomorrow’s adventures as the jets work on any wipeout-related kinks. Condo suites at Park Regency are cozy, clean and wonderfully-appointed. Full kitchens have everything you need to cook up your favorite dish – plus a dishwasher and coffee maker. A living area with flat screen TV and a wood-burning fireplace is the perfect spot to cozy up for some downtime after a day on the slopes. Between a comfy Queen and a sleeper sofa in the living room the standard one-bedroom is prime for couples trips and small groups. If you’re traveling with the whole crew, try the deluxe one-bedroom for some added space – it features two bathrooms and an added set of twin bunkbeds or twin beds, perfect for family trips. Every suite has a little patio, so get some fresh air and enjoy the views. Complimentary on-site laundry is an added bonus (and lets you pack light). With a locale so central, a variety of tasty dining is just steps away. El Chubasco dishes up traditional Mexican cuisine and is known for their salsa bar (20 different salsas made fresh daily!). Got some picky eaters in your bunch? Sammy’s Bistro serves all the classic breakfast fare, plus an extensive lunch and dinner menu with favorites like wings and nachos, burgers and steak, pasta dishes and a solid kids’ menu. For a quick and tasty breakfast (and maybe a latte) just pop over to Einstein Bros Bagels! - Front desk is open 7:00 AM-11:00 PM daily. Guests that are planning to arrive after normal front desk hours can pick up keys to the unit from a lockbox. There are two lockboxes located to the right of the lobby. Guests must use the phone in the upper lockbox to get access to the lower lockbox that will have the key to the unit. For more details please contact the property using information on the booking confirmation.